Cut 2 layers of Osnaburg 11” x 16”, on grain. Cut 1 layer of Muslin 12” x 17” to be the base layer. Stack layers right side up with muslin base on the bottom. Using a wash-out marker and a quilter’s ruler, mark one 45° line diagonally across the stacked fabrics. Sew on the line, then sew parallel lines equal 3/8” distances apart out to the ebdge of the fabric. Turn fabric and repeat on the other side of the original line until the entire piece is stitched. Along the edge of one side, use a small sharppointed scissors to make a small, starting cut just through the top 2 layers of osnaberg, midway between all the stitching lines. Use a Clover™ Chenille Slash Cutter and finish cutting each row between the stitching. DO NOT CUT THE MUSLIN BASE LAYER. To secure the ends of the chenille through washing, straight stitch all around the perimeter just along the ends of the stitching lines with the wrong (uncut) side up. Machine wash and dry the prepared chenille piece 2 or 3 times to fluff the raw edges. Cut 4 layers of the “blue with white stars” fabric 5” x 7”, on grain. Stack layers right side up. Using a wash-out or chalk marker and a quilter’s ruler, mark one 45° line diagonally across the top layer of stacked fabrics. Follow steps 5 through 10 above, substituting the bottom blue layer for the muslin layer that does NOT get cut. Spray Sulky KK 2000 on the wrong side of each of the red stripe template pieces (#2-R & 4-R, #9-R, 10-R,11-R). Lay them right side up over the right side of the red star fabric. Lay them right side down on a piece of cardboard or a grocery bag and spray them with KK 2000. Turn the off-white chenille piece so the muslin side is up. Place the stripe templates (#1-C, 3-C. 5-C) and the star for the sleeve (#8-C) right side down over the muslin side of the off-white chenille. Trace around the pieces with a wash-out or chalk marker. Straight stitch around each tracing just inside the drawn line. Cut them out on the drawn line. Repeat for the blue star chenille fabric piece 6-B. Prepare the sweatshirt for applique by cutting open one sleeve of the sweatshirt from cuff to armhole. Spray KK 2000 on Sulky Tear-Easy and place it on the wrong side of the sweatshirt under the areas to be appliqued. On the right side of the front of the sweatshirt, spray KK 2000 on the wrong side of each of the pieces and position them, spacing the stripes approximately 3/8” apart (use the photo on the front of this pattern as a guide). By using KK 2000 you can reposition the pieces as many times as needed to get your applique just the way you want it. Place the open-toe applique foot on the machine. Using Sulky Clear Invisible Polyester Thread on top and a dark blue Sulky 30 wt. Cotton Thread in the bobbin, stitch an open zig-zag over the edges of the off-white chenille pieces. Insert a 14/90 needle in the machine. Use a matching Sulky 12 wt. Cotton Thread on top with a coordinating color ofSulky 30 wt. 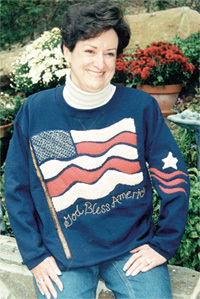 Cotton in the bobbin to satin stitch(or choose a decorative stitch) applique the edges of the blue red stripes and the flag pole pieces. 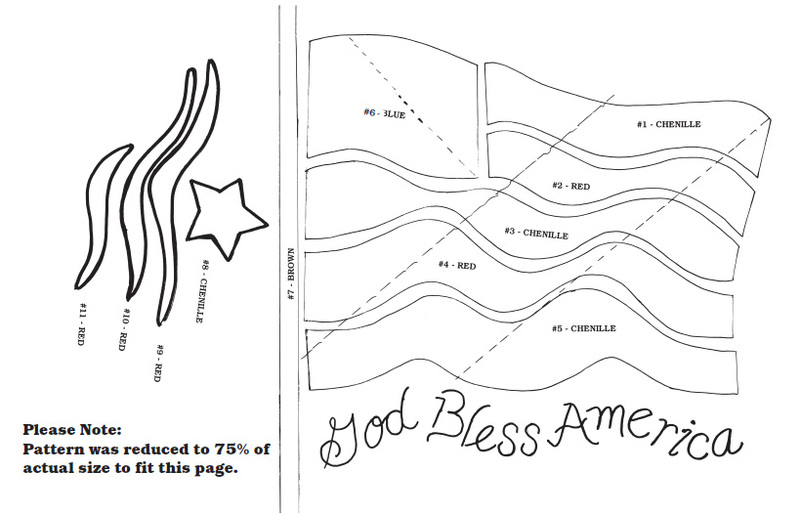 Lightly spray KK 2000 onto a strip of Super Solvy or UltraSolvy and lay it over the pattern sheet to trace the phrase “God Bless America” onto it using a fine-line, permanent-ink marker. 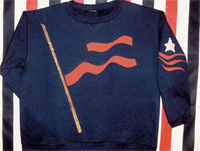 Reapply the KK 2000 if needed and place the saying just under the bottom stripe of the flag. Set up your machine with a 16/100 needle and an extra spool pin. Thread the needle with two Sulky 12 wt. Cotton Threads #567 Butterfly Gold and #1057 Dk. Tawny Tan. Put Sulky 30 wt. Cotton #567 in the bobbin. Spray KK 2000 onto a piece of Sulky Soft ‘n Sheer and place it behind the sweatshirt where the writing is to be placed. If you used Ultra Solvy, wash the garment to remove it. Remove Super Solvy by holding a steam iron above the Super Solvy and steaming to gently release it from the stitching.